Gotham TV show on Fox, a Batman prequel, reviewed. The superhero trappings of Gotham are just a clever disguise. 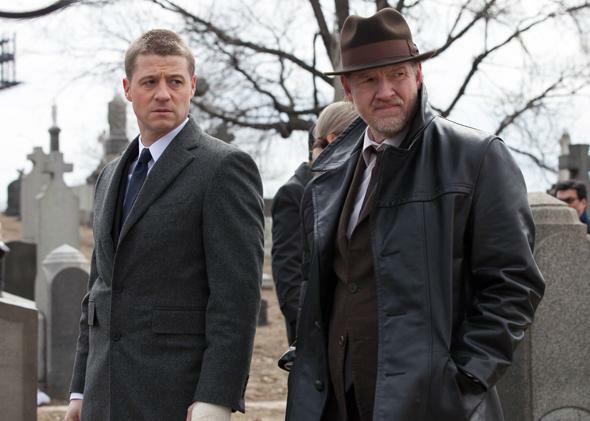 Detectives James Gordon (Ben McKenzie) and Harvey Bullock (Donal Logue) in Gotham. Superheroes: beacons of hope, of inspiration, and of cold, hard cash. Having reliably raked it in for movie studios for years now, brand-name superheroes are being drafted by television networks who are looking for the audiences and the advertisers that come along with boldface names in tights. Last year, ABC trotted out Marvel’s Agents of SHIELD, an Avengers spin-off both dull and craven. (People with more patience than me say it got better as the season went on.) And, Monday night, Fox premieres Gotham, a sort of Batman prequel, which has the dubious distinction of being the new series that most completely exceeded my expectations of it. I was not, it’s probably clear, expecting very much. But Gotham reverses the normal superhero disguise: It is not a superhero dressed up in street clothes, it is a gritty noir dressed up like a superhero. Ben Mackenzie stars as Jim Gordon, who is not yet police commissioner, but still a young, self-righteous, morally upright detective trying to make a difference in the cesspool of crime and corruption that is Gotham City. Partnered with wily, sleazy Harvey Bullock (Donal Logue, great as usual), Gordon’s first case as a detective is a doozy: the seemingly random mugging and murder of two of Gotham’s poshest citizens, Thomas and Martha Wayne. At the crime scene, Detective Gordon comforts their son, a young, serious, watchful boy named Bruce. Batman mythology is threaded throughout the pilot. Not only do we get Bruce, we also get a teenage Catwoman—who frames the narrative—and Oswald Cobblepot—the over-eager apprentice of one of the town’s major underworld players. (Oswald really hates it when people call him the Penguin.) But all of these Batman-mythology markers don’t overrun the show, which is a hard-boiled detective series with a great setting it doesn’t squander—not Gotham City, per se, but a city incapacitated by greed, fear, and dysfunction. It could be New York City in the ’70s, except for the bad guys with the wonderfully cartoonish names, like Cobblepot and Fish Mooney (Jada Pinkett Smith). The police force is almost wholly corrupt and criminals and the mob are running things. For a young, well-meaning officer to do good, he needs to learn how to operate within this broken system. It’s a great place to set a TV show, with or without the promise of Batman. Batman, of course, is the one iconic superhero who doesn’t really have any freakish talents, just a lot of great technology and serious emotional problems. In the pilot of Gotham, similarly, nothing supernatural occurs. The plot is straightforward: Gordon is naively keen to solve the murders, but to get anywhere he needs Bullock, who knows how to talk with Mooney, a steely operator who we first see gracefully beating a man who may have betrayed her. Gordon treats both Bullock and Mooney with disdain; he has a more pristine moral code than either of them, but his inflexibility, his implacability, and his conviction that he knows best are, for now, weaknesses more than strengths. He’s a bit of a prick, really, and he can’t begin to imagine just how rotten to the core Gotham City is. And yet, as gritty and grimy as this show is, its world is still the world of Batman, a caped crusader who will someday reside among future bad guys with names like Edward Nygma. There’s more noir flair to Gotham than there was to Christopher Nolan’s deeply morose take on the Dark Knight, and there is, also, built in, a little, hope. Gotham City will always have its problems, but we know things will improve. One day, it will have a genuinely decent police commissioner, not to mention a man dressed up as a bat monitoring the streets.